When loading a spinning or baitcasting reel with fishing line, make sure the line comes off the top of the spool (as shown), and not the bottom. Improperly spooling fishing line onto a reel creates many problems. A family member bought you a nice spinning outfit for Christmas. Despite the cold, your desire to cast the new rod into water propels you to a local Fishing in Neighborhoods (FINs) lake to try to fool some winter rainbow trout. Dutifully spooling on some fresh 4-pound test monofilament, you cast a red and silver in-line spinner a few times. As you move to a new spot and shoot a cast, you hear a sound similar to a flushing covey of quail and see a ball of spaghetti moving up the rod. You now have a bird’s nest of epic proportions, requiring cutting off the mess, pulling out the loops and retying the lure. You curse the brand of line you bought. In all likelihood, it isn’t the line’s fault. Properly loading fishing line onto a spinning or baitcasting reel is a skill many anglers take for granted, but often do incorrectly, greatly reducing the line’s performance. Incorrect line loading often causes tremendous line twist, the main culprit behind bird’s nests. 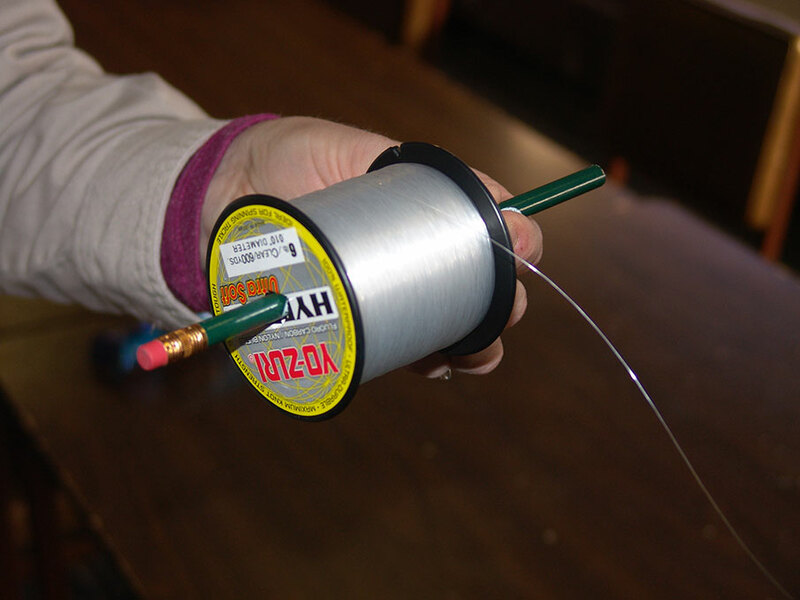 For spinning reels, first make sure the line you’ve selected matches the capacities of the reel. These capacities are always labeled on the side of the reel’s spool. Don’t load 10-pound test line onto a reel designed to accept lines from 2- to 6-pound test. Begin by placing the filler spool onto a table or floor with the label facing up. Run the tag end of the line through the stripper guide - the largest guide closest to the reel – and to the reel. Open the reel’s bail and wrap the line twice around the middle of the reel spool, tie an overhand knot and tighten. Follow up with another overhand knot and clip the line about ¼-inch from the knot. Make sure to clip the tag line, not the main line leading back to the filler spool. Reel some line onto the spool and stop. Lower the rod toward the filler spool. If the line begins to jump and twist, flip the filler spool over, placing the label down. Sometimes, the direction the line was spun on the filler spool at the factory and the direction the spinning reel places line on the spool are not in synchronization, which causes enormous line twist. Flipping the filler spool alleviates this problem. If the line comes off the spool in big loose coils and doesn’t twist, keep reeling until you fill the spool to the thickness of a nickel from the spool lip. Another way to load the spool involves a helper. Have the helper run a wooden pencil through the hole provided in the center of the filler spool housing. Run the line through the stripper guide and tie on to the reel spool. Ask the helper to hold the spool and pencil assembly perpendicular to the reel, similar to the way a wheel rotates on an axle, and apply gentle pressure to the filler spool with their fingers. The line must come off the top of the filler spool toward the reel, not the bottom, or it incurs line twist. Resist the temptation to overfill a spinning reel’s spool. If you’ve ever opened the bail on a spinning reel and line shot off it like a top, then you’ve witnessed the results of overfilling the spool. You can lose half a spool of line from twists, tangles and bird’s nests from overfilling a spinning reel. Manually closing the bail of a spinning reel with your hand after making a cast is one of the best ways to keep line twist at bay while fishing. Each time you close the bail by turning the reel handle, you apply twist to the line. Over a day of fishing, these twists add up and produce loops and tangles that eventually lead to a mess. After a few fishing trips, manually closing the bail becomes second nature. To fill baitcasting reels, run the line from the filler spool through the guide closest to the reel and through the line guide of the baitcasting reel to the spool. You can simply run the line through the holes in the ported spools found on most baitcasting reels today and start reeling. Or, secure the line to the spool with an arbor knot. Both techniques work. The pencil through spool with a helper technique works best on baitcasting reels. Again, make sure the line comes off the top of the filler spool, not the bottom. You can also do it by yourself by placing the filler spool on a table with the label up and checking for twist, but the pencil through the spool method works much better for baitcasters. Fill the spool to within a 1/16-inch of the rim and, again, resist the impulse to overfill the reel. Don’t let line problems stemming from improper loading ruin a day of fishing. Following these simple procedures will achieve the best casting distance for your spinning and baitcasting reels, keep tangles at bay, and extend the life of your line.